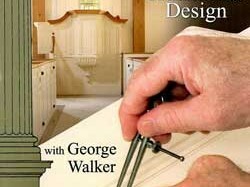 This week Marc and Matt are reviewing the Lie-Nielsen Toolworks title “Unlocking the Secrets of Traditional Design” by George Walker. Furniture is pleasing to the eye when various elements work together to create a harmonious whole. 18th Century furniture design, like architecture, relied heavily on proportional schemes derived from classical architectural orders. Today’s furniture makers can use these design principles to create contemporary or period furniture. George Walker demonstrates how to use this approach to create visual harmony.